Watching the surreal videos of the police takeover of Turkish newspaper Zaman last week — inside the building police officers played cards behind the newspaper’s reception desk and devoured plates of baklava in the cafeteria as journalists looked on — I was reminded of the events of the past eight years that so definitively transformed Turkey’s media scene. The change happened so gradually over the years that many missed the transformation. 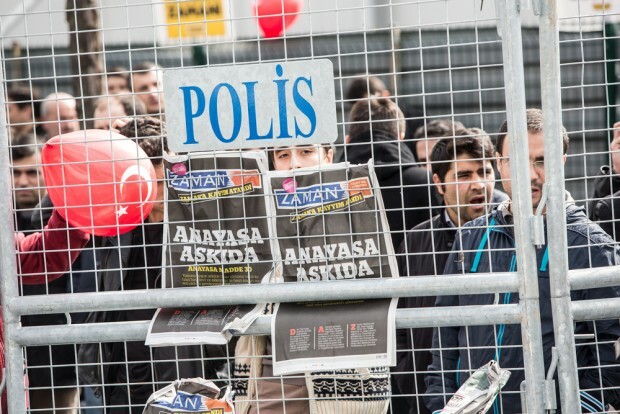 But journalism in Turkey has turned into a scene of feuds and long-held hostilities. The job description of a Turkish journalist now includes the ability to help lock up journalists from the opposite political camp. Over the past eight years, a spate of legal cases have altered Turkey’s media environment beyond return. The most recent of these was the 2014 Selam Tevhid case, in which prosecutors intended to jail Turkey’s pro-government journalists who were accused of being foreign spies and aiding terrorist organisations. But it was the OdaTV case of 2011 that had the greatest impact on journalism. The outcome silenced the popular and populist voice of secular nationalists and spread fear and paranoia to all media workers. Earlier, in September 2008, after selling off his secular-nationalist broadcaster KanalTurk, Turkish journalist Tuncay Özkan was detained by Turkish police in relation to the Ergenekon investigation. He was detained in the Silivri Penitentiary, Europe’s largest penal facility where he would await the outcome of his trial for more than two years. One of Özkan‘s friends, Mustafa Balbay, the Ankara correspondent of Cumhuriyet newspaper, was also imprisoned in the same trial. To many observers, Özkan’s and Balbay’s ideas were old fashioned, parochial and too nationalistic, views that somehow defined the way they were treated in the public sphere. There was little international reaction when Özkan’s KanalTurk‘s staunchly secularist and republican editorial line was changed overnight. The same broadcaster now defended polar opposite views. After five years in detention, Özkan was sentenced in April 2013 to life imprisonment for being part of Ergenekon, a “ultra-secularist organisation that plotted a coup”. Balbay was luckier: he received 34 years and 8 months. Again, there was little world reaction to this surreal turn of events, but, in Turkey, many progressive voices applauded the verdicts, seeing them as part of what they ominously called the country’s “normalisation”. Throughout 2008, Turkey’s media sphere changed enormously through these trials that made the criminalisation of Turkey’s media part of the journalistic occupation. More than a dozen journalists were detained in the OdaTV trials, accused of being members of the “media arm” of the terrorist organisation Ergenekon, named after Turks’ founding myth. There were so many arrests that the prison’s sports hall needed to be transformed into a courtroom to accommodate all the defendants. Many of Turkey’s progressives bought into the idea that what was happening was a good thing. Once “ultra-secularist coup plotters” would be placed behind bars, Turkey would finally achieve its long-awaited “liberal consensus”. Those who opposed the arrests were branded reactionaries who should have known better. According to the newspapers, Turkey was cleaning its bowels: there were lone dissenting voices but the general reaction to the prison verdicts was that all the bad, radical people were finally getting what they had long deserved. The normalisation discourse was built on the idea that Turkey needed a “liberal consensus” where the extreme elements of politics and the media needed to leave the public sphere to moderates of all political persuasions. Thanks to this, Turkey would be able to become “a model democracy” in the Middle East. Worryingly, the Ergenekon and OdaTV trials moulded a new type of journalist who took pleasure in the jailing of his colleagues. After journalist and IPI World Press Freedom Hero Nedim Sener and his colleague Ahmet Sik were detained in 2011, they were conveniently added to the list of coup plotters. When journalist and editor Soner Yalcin was arrested in February 2011 along with other OdaTv journalists, this was seen as a blow to Turkish nationalism, rather than journalism. In the fight with nationalism, the locking up of nationalist journalists was seen as a necessary evil. By 2011, the process that had begun in 2008 reached new heights, when the character assassination of journalists became commonplace in the Turkish press. It was now acceptable to publish transcripts of phone conversations between journalists who might have been plotting a coup. A more troubling development was the rise of a new genre: more and more journalists devoted all their work to making incriminating accusations against their colleagues. The success of a journalist’s work was now defined by the outcome of trials he had supported with his columns: if he managed to get his colleagues convicted through defaming their character, he was promoted. No political group was able to resist the attraction of this new, adrenaline-ridden form of journalism and, most alarmingly, readers who followed those developments, started taking joy in this spectacle, a development that would surely fascinate Michel Foucault. Journalism became meta: newspaper front pages tallied which journalists were locked up and which were freed. There was fresh material every other month: the political identities of imprisoned journalists changed but the end result was the same. It is now clear how Turkey’s fake “liberal consensus” failed spectacularly. However unpalatable progressives found them, Turkey’s secularist-nationalists, socialists and communists defended their right to exist in a society where they constitute a historical phenomenon alongside Turkey’s conservatives. Their imprisonment in the name of normalisation was unacceptable and immoral. Instead of a liberal consensus, what Turkey needs is a proper dissensus: the coexistence of these different political camps.